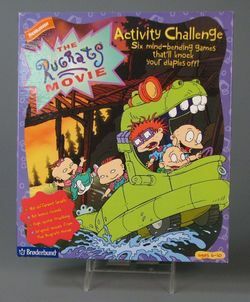 The Rugrats Movie Activity Challenge is an adventure game released by Brøderbund Software for Microsoft Windows on May 3, 1999; as the name suggests, it is the fourth title for the Rugrats series, and the second to be based on the first movie (but the graphics are superior to those of The Rugrats Movie, given that it was only released for the Game Boy and Game Boy Color in the previous year!). NAPTIME IS OVER! The Pickles have a new bundle of joy, baby Dil...which means Tommy, Chuckie, and their friends have a new bundle of adventures. Build important problem solving, creative, and critical thinking skills while playing six mind-challenging games with the Rugrats gang. Only the truly brave need apply. This page was last edited on 11 November 2016, at 11:11.